This Spring, we partnered with selected artists from DC & beyond on the curation of our first streetwear line, KRU 2016: The Artist Collection. We collaborated specifically with artists known for their strong, clean signature styles that we admire and respect for their art and the uplifting messages consistently expressed through it. The collection ended June 30th and was a success! Thanks to all the talented artists and change makers in our community that participated. This huge push was a first for us on several fronts. It was our first time opening an online shop, a first time collaborating with 14 local & international artists. 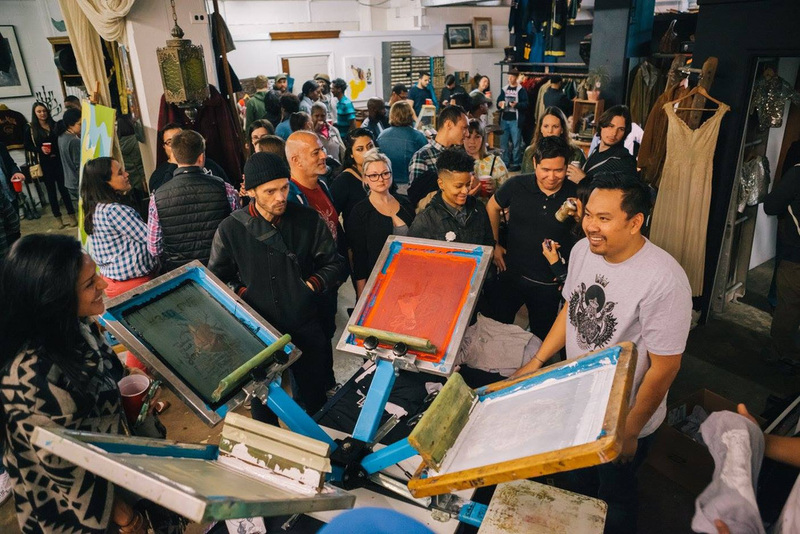 Our launch party was the first time we threw our own event and collaborated with local small businesses Nomad Yard and Jos. A. Magnus Distillery and musicians CMPVTR CLVB. Finally, the collaboration culminated in the collection being featured at the Smithsonian Asian Pacific American Center in the Crosslines: A Culture Lab on Intersectionality exhibit. More info on the collection below. The moniker KRU is an alternative to the English word CREW, but beyond that and more importantly it is meant to pay homage to the spirit of the Liberian Kru people who vigilantly refused to be captured into slavery and have history in the DMV area - resisting settler's efforts to control their trade in Maryland. The Kru were known for their skills in navigating and sailing the Atlantic. Their history is one marked by a strong sense of ethnicity and resistance to occupation. In the same vein, Soul & Ink considers all artists participating in this collection to be modern day rebels, renegades, and freedom fighters in their own right - adamantly dedicated to manifesting their own destiny, representing culture and freedom while blazing trails along the way. Together through this collection, we are able to represent and celebrate the myriad of subcultures and history of DC that makes it such a vibrant community today. THANK YOU to those who came out & celebrated with us at our KRU 2016 Collection launch party! Special shout out to the illustrious Erika Layne Photography. View the photo album here. Read our announcement newsletter for the launch party here.